Last week I wrote about the Bechdel Rule. So today I wanted to share Part I of some quality television shows that not only meet the Rule but also cover a variety of genres. 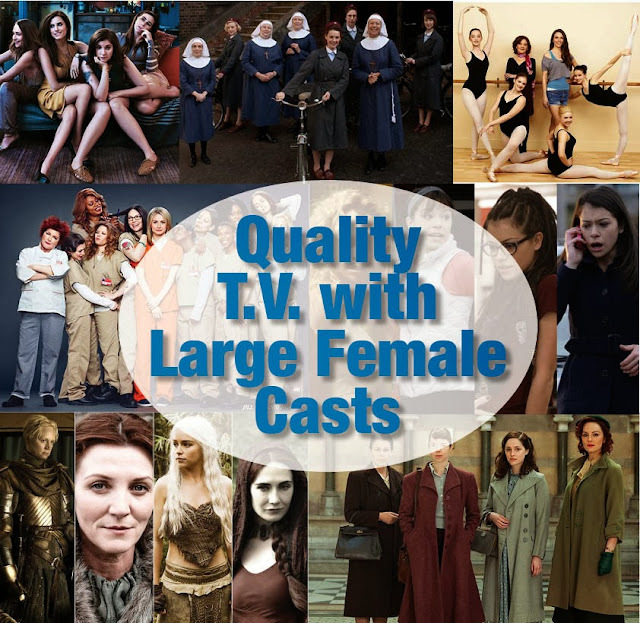 I am a big fan of all these shows and the actresses that star in them. If you would like to watch one of these shows from the beginning you can find them on DVD, Amazon streaming, iTunes, and/or Netflix. Call the Midwife is a period drama based on the book by Jennifer Worth. As the title suggests, this is a story about midwives working out of a nursing convent in the 1950s. We experience the beginning of the show through the eyes of Jenny and her resulting culture shock after moving to the impoverished neighborhood of East London. We not only learn about Jenny, but also the other young nurses and nuns at the convent and their many patients. Their stories are warm and moving but they are not light and fluffy. It's the grittiness in Midwife that both disturbs and delights me. Orphan Black - Okay, this is a bit of a cheat because the large female cast is played by a single actress, Tatiana Maslany. Orphan Black is a science fiction series about a woman who discovers her clone. She risks danger repeatedly in order to find more clones and figure out the secret of their creation. The best part: The lead. Tatiana Maslany plays so many distinct characters so well you forget it's the same actress playing all 4 characters in the same room. She is amazing. Game of Thrones is a extremely popular fantasy series on HBO. It is based on the books by George R.R. Martin. Everything about this show is intriguing and surprising. The acting talent and production value are through the roof. To watch this show it to live in another world. The fourth season will be on again in 2014 so you have time to binge watch! The best part: The women of this universe are every bit as three dimensional and vital to the story as the men. The Bletchley Circle is a period drama and a murder mystery. It is about four women who worked as codebreakers in England during World War II. The show is set in 1952 when they reunite to track down a serial killer. The women see patterns in the killer's work that police have overlooked. The best part: Four female codebreakers in 1952 England track a serial killer! For three more contemporary shows with large female casts please read Part II.